If it were not for my power tools, I would still be sanding these fenders. I used my Shopsmith belt sander for the front and back of the fenders. One slip with small parts and it's all over for that one. Very light and very careful is the name of the game here. Next, I used the 1 inch Delta belt sander for the outside curves. 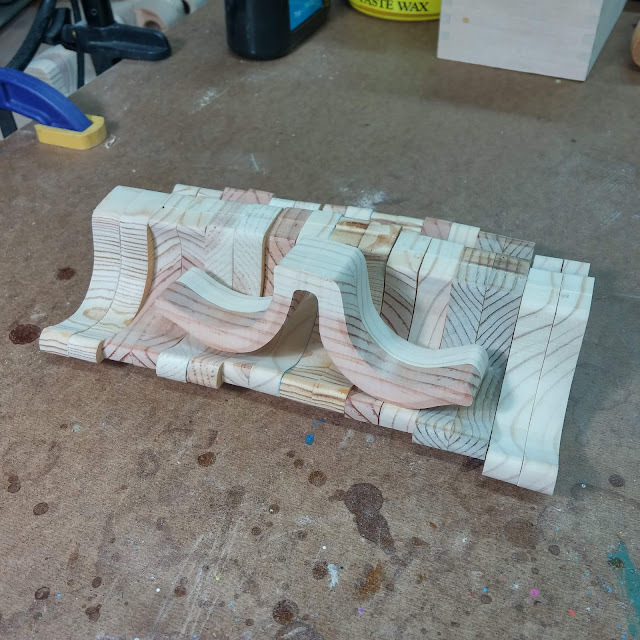 The belt is flat, but with a little practice, you can easily sand outside curves. There isn't much chance of breaking the piece, but even with a 240 grit belt, it can be very aggressive. If you go to fast, slip, or push too hard, it's easy to ruin a part. I sanded the inside curves with a spindle sander. ASgaina light touch is required. Approach the spindle at the wrong angle or get a little too aggressive and it will take the part away from you and throw it across the room. Slow and gentle is the name of the game here. There are a few places that require hand sanding. The spots where the machines can't reach. I have an assortment of shop made tools for this. Mostly pieces of wood in various sizes and shapes with sandpaper stuck to them and fingernail file scraps.